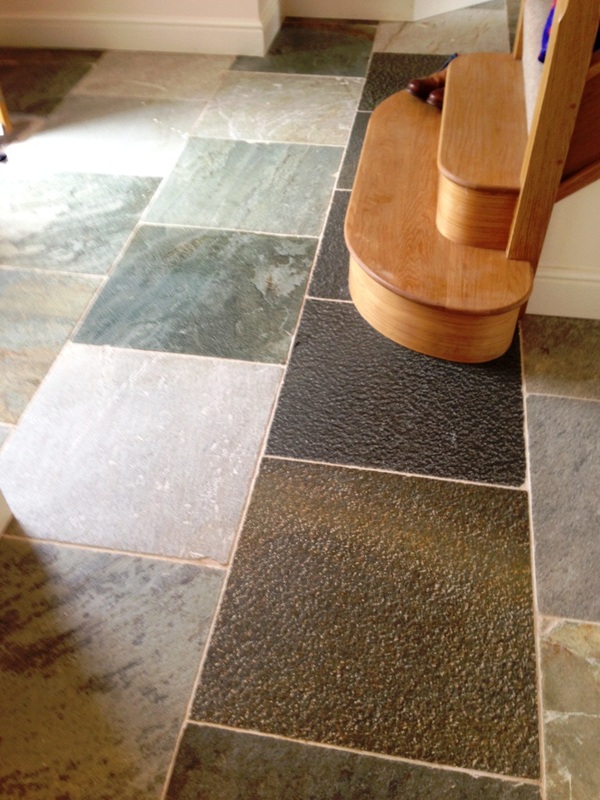 These mixed milled slate floor tiles were installed in the Kitchen, Hall and toilet of a house in Broadwell, Warwickshire. 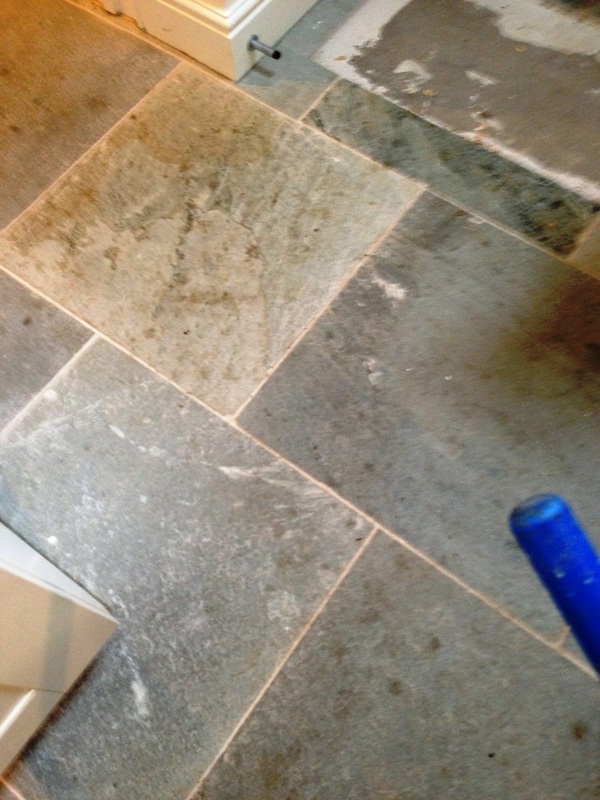 The Slate was staining easily from drink spills and proving hard to clean; on top of that all the tiles were covered in a slight grout haze and had not been sealed or cleaned properly after installation. The customer needed the floor to be easy to clean and manage and was keen to bring out the rich colour and texture of the floor but keep a matt finish. 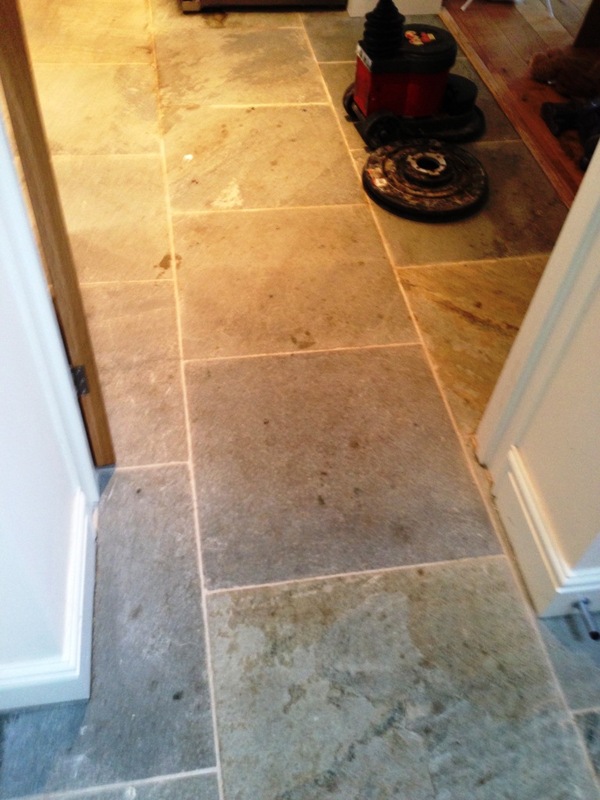 The first job was to give the floor a deep clean using Tile Doctor Pro-Clean which was worked into the pores of the Slate tile and grout using a slow speed rotary machine fitted with a scrubbing pad. I then used a wet vacuum to remove the resultant soiled solution and rinsed the floor down with water. The next step was to tackle the grout haze which was evident across the tiles; for this we used Tile Doctor Grout Clean-Up which is an acidic product that you allow to dwell on the tile for a one to two minutes and then agitate with a scrubbing pad and then remove shortly afterwards with a wet vacuum washing the floor down quickly to ensure the acid is removed. Further cleaning was required to some areas which had proven stubborn to clean earlier and for this we used Pro-Clean again mixed 50/50 with NanoTech UltraClean which adds tiny abrasive particles to make a more effective cleaning product; again this was scrubbed in and then once we were happy with the result the floor was washed down with clean water in order to neutralise it before sealing. I left the floor overnight to dry then came back next day and used a damp test meter to verify the floor was dry and ready for sealing. 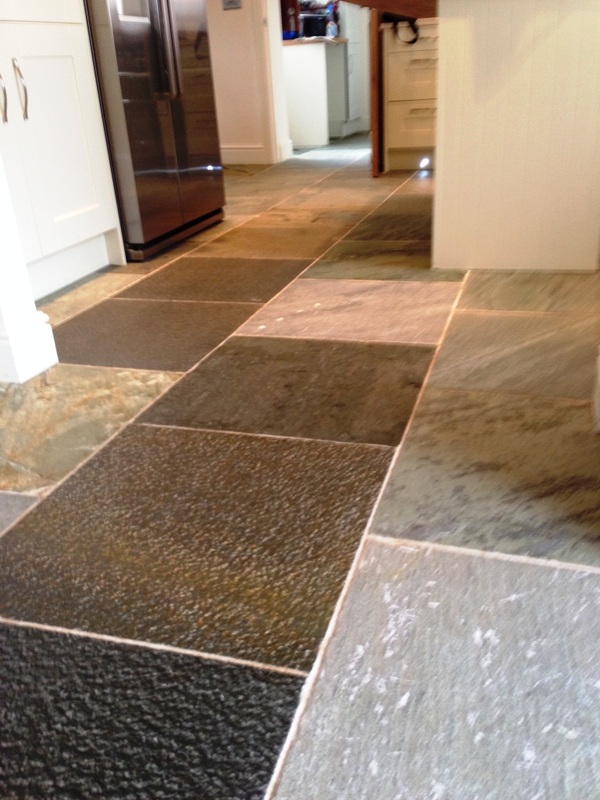 Once happy I proceed to apply four coats of Tile Doctor Colour Grow which matched their requirements in a sealer exactly as it provides a matt finish brings out the colour in the stone and offers great stain protection. Michael was a really nice guy who worked hard to clean and seal the stone floor in our kitchen and conservatory. Pleased with the work done and how approachable (and chatty) he was. Great work, would recommend. We were very pleased with the final result, particularly the replacement of broken/missing tiles and removal of some ghastly yellowish concrete filler which had presumably been there for years and years. The circular cleaning machine has left very faint indentations on the surface that can sometimes be seen in reflected light; though perhaps these will wear down as we add more layers of sealant. Overall, very happy – a huge improvement and probably beyond our initial expectations. And much cheaper and better than buying and installing new tiles! Mick was on time for the initial appointment, quoted clearly and carried out the work to a high degree on the date agreed. The floor has regained the colours and looks like when it was initially laid 18 years ago. Mick did an excellent job in the time quoted. Very happy with our floor, wish we’d contacted Tile Doctor before! Thank you so very very much. My floor didnt appear to be dirty until Mr Gayton started to clean it I was delighted with the result and will definitely use Tile Doctor again. My hall now looks lovely and I’m not embarrassed of it! The broken tiles have been replaced and the whole thing cleaned to reveal its true colour and lovely sheen. Very pleased.